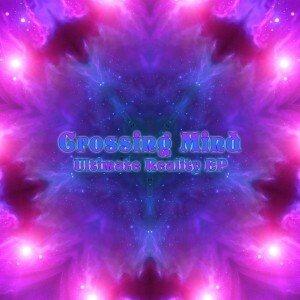 Underground Alien Factory Records presents Ultimate Reality, a collection of five unreleased songs by Crossing Mind (Stéphane Béze), a French new school Goa trance producer. Following up on the 2010 release of his debut album on DAT Records, The Holographic Paradigm, Crossing Mind returns with this mix of new and old uptempo and downtempo trance songs to build a link between his past productions and his current projects. The guideline is always strong melodies and great atmospheres with emotional vibes in keeping with the best of the spirit of Goa trance. Mastered by Strudy Pete with cover art by Imba. MP3 Download | FLAC Download | WAV Download · Download count: 13,874. Very good music! In the spirit of old goa trance! Many-many thanks for this wonderful EP! Epic journey from the beginning till the end. I listened to the whole EP four times last night. Such enchanting soundscapes! Now listening to it… and really enjoying it so far! “Nova on night” est le meilleur track pour moi, vraiment bon ! Bonne continuation ! This really is something special. I feel kind of ‘floaty’ after listening to this. Great atmosphere espacially Nova on Night!!! BOOM!! PROGENIC is the track that is MOST awesome, just to point this out to anyone reading this. Listen to it. Its simply amazing. Lets all stick around 120 bpm and listen to what Aes Dana or Asura and others have produced around that bpm. This is it! (at least for me…). I havent heard that for a long time. T H A N K Y O U. Keep producing 120 bpm!!!! finally No Way Wrong avaible on pro release! Thank you for this fine offering. I really enjoyed your recent album also. Looking forward to your next album. Good sounds, but it really hurts me to see a cover where I can’t read the text!!! It’s really sad, I hope in further releases you pay more attention to it, text is to be read. I agree with sacral.. I liked the 120 BPM a lot. The whole album is sick but the last two tracks bring it all home. Amazing old goa , Power of trance into my favorites !!! Great music! Excellent balance between positive goa vibrations and psychedelic energy waves. Rating 5 of 5. The real deal. . . Very nice! Excellent mastering as well, loud and fat enough. Excelente musica, energetica, cerebralmente muy estimulante, los felicito, gracias.